In Part 1 of our blog series on Causes for Insomnia, we highlighted a few of the psychophysiological factors that cause poor sleep. In this second part we will describe a few environmental factors that can contribute to insomnia. For better or worse, kids can wreak havoc on parent’s sleep, many of whom slept fine before they had kids. During pregnancy, a woman’s sleep may be disrupted due to changes in hormones or discomfort later in her pregnancy. After the birth of their infant, new parents lose, on average, about 900 hours of sleep in the first year. This sleep disruption causes loss of a parents total sleep time and can elevate physiological and psychological stressors. For some parents, even after their child has learned to sleep through the night, their sleep remains impaired. Without intervention to help the parents learn to fall and stay asleep, they can develop insomnia which can last for months to years. Much like a train, once derailed, sleep may have a hard time to getting back on track. Another common environmental contributor to insomnia is a snoring bed partner. Many times, people feel they have to simply cope with the snoring. A natural awakening in the middle of the night (e.g., to roll over, use the restroom, etc.) may be extended because it becomes hard to fall back to sleep if their partner is snoring loudly. Frequent sleep disruptions due to one’s bed partner snoring can result in the development of insomnia. Interestingly, we surveyed 300 people and 75% said they want dates to be up front about their snoring, but 89% said it would not be a deal breaker in a relationship. Jet lag may be a significant contributor to sleep disturbance. Our biological clocks are roughly synchronized with the rising and setting of the sun in our local time zone. When we travel across time zones, our biological clocks get thrown out of sync and it may take days or even weeks to adjust. The severity of jet lag complaints generally correlate with the number of time zones crossed and the direction of the travel. Eastbound is generally more troublesome than westbound though this is not the case for everyone. Check out our video with tips for coping with jet lag. Shift work may also contribute to poor sleep or the development of insomnia. Shift work is defined as someone whose work schedule is outside of a regular 9am-5pm job or has a varied work schedule. An example of this would be an ER nurse working four 12-hour shifts then having three days off. The nurse’s erratic schedule could affect her biological clock and result in her sleep being disrupted. The last environmental factor we will describe in this post relates to changing jobs or living situations. Adjusting to new environments and people can cause stress and, for some, stress can result in disrupted sleep or a change in their sleep schedule. 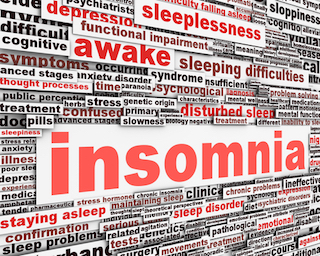 As we discussed in the last article, this can trigger a genetic predisposition for insomnia, which then prolongs the effect of this temporary stress to a long lasting chronic insomnia. It’s important to give yourself plenty of time to adjust to new surroundings, and develop strong sleep habits to keep your sleep on track. Regardless of the contributor, the good news is that insomnia is not a lifelong “sleep sentence” and can be effectively treated. Taking care of your sleep is imperative for your overall health and well-being so make healthy sleep a priority regardless of your environment! Next time, in (Part 3) of our series of Causes for Insomnia, we will discuss the physical contributors. Stay tuned.